Earlier today, the Virginia Beach police department finally changed their tune about Michael Vick's possible involvement in the shooting that took place outside of Club Guadalajara; the site of Vick's 30th birthday party. Originally Police spokesman Adam Bernstein said Vick's was "not a person of interest," but now he and the department do not know a title to give Eagles quarterback Vick. With these new reports bubbling to the surface, Vick and his attorneys decided it was time for Vick to tell his side of the story. In an issued statement by his attorney Billy Martin, Vick claimed that "he had nothing" to do with the shooting that occurred the night of his 30th birthday party. Additionally, the troubled quarterback said he has been in full cooperation with the police department since the beginning of the investigation. On June 25, 2010 I attended a birthday party held in my honor at The Guadalajara’s Restaurant in Virginia Beach, Virginia. After I left the event, I learned that a man was shot outside the restaurant. I want to assure everyone that I had nothing to do with that incident. I left the restaurant prior to it occurring and did not witness what happened. Following the incident, I reported it to the Philadelphia Eagles and to representatives of Commissioner Roger Goodell of the NFL. In addition, I cooperated with and answered any and all questions from Law Enforcement officials investigating this matter. My statements, from the beginning, explained that I was not there at the time of the shooting and had no knowledge of the events surrounding it. I have been completely truthful and fully cooperative from the very beginning and will continue to cooperate with Law Enforcement and the NFL as this investigation continues. Besides Vick discussing the shooting, mentor and Vick supporter Tony Dungy released his own statement to Philadelphia Inquirer's Jeff McLane on the entire situation. "The only thing he is guilty of is using bad judgment and attending and publicizing parties open to the public and utilizing his name to get people there," Dungy said. "Hopefully he learns from this." 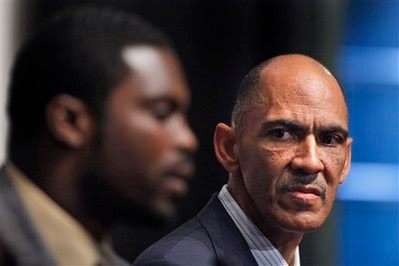 Certainly, Dungy knows Vick extremely well since he was by his side and guiding him during his reinstatement into the NFL. Even though Dungy is very well respected around the league, his credibility is on the line as well with the outcome of this case. He vouched for Vick being a new man and that he deserved a second chance. Now it is beginning to look like Vick did not appreciate his new opportunity. In addition, as part of Vick's reinstatement into the NFL, he promised NFL commissioner Roger Goodell he'd use better judgment. When his mentor and backer comes out and says he used "bad judgment," it does not look like Goodell will just slap Vick on the wrist for this whole incident.